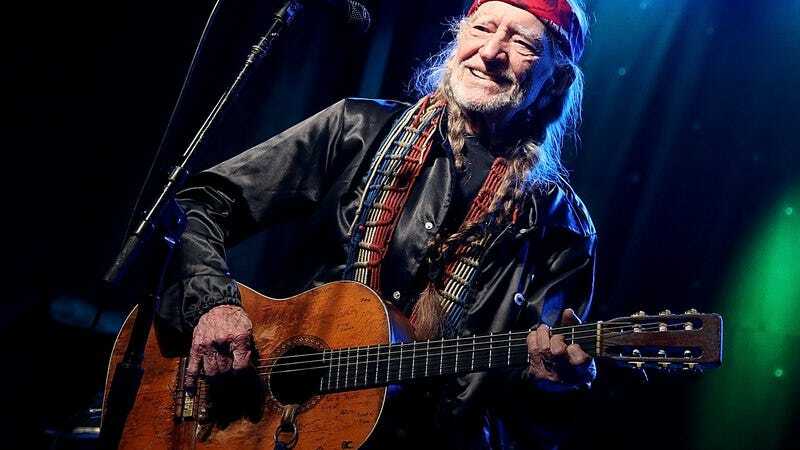 Willie Nelson’s public persona is a fascinating paradox: He’s both one of the elder statesmen of classic country, still capable of tossing out lively, instantly listenable anthems, apparently on a whim, and also one of America’s top-tier pot-smoking weed men. Given that it’s 4/20, the national holiday for medicinally blissed-out tokers, you might expect Nelson’s new offering, God’s Problem Child, to indulge in that hazier side of his soul. Instead, it’s pure country, although that doesn’t mean you can’t celebrate Nelson’s legacy by streaming the album today via NPR. The album is a mixture of ballads and more lively stuff, with the most rollicking being the sarcastic “Still Not Dead,” in which Nelson jokes about reports of his death being greatly exaggerated. (Admittedly, it’s a little weird to hear Willie Nelson sing about the internet in that distinctive twang, but the end result is still pretty fun.) There’s also “He Won’t Ever Be Gone,” Nelson’s tribute to his old friend Merle Haggard, which includes a few winking nods to “high times.” The whole album is part of NPR’s First Listen program, and should serve as a perfectly pleasant backdrop for whatever activities keep you calm and relaxed this April afternoon.